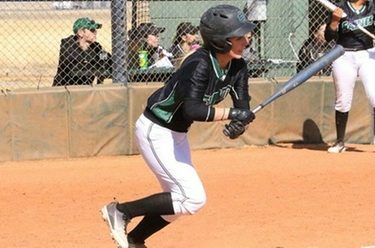 LIBERAL, Kan. – The Seward County softball team (8-10, 2-0 KJCCC) started off conference play with a sweep against the Colby Trojans (11-5, 0-2 KJCCC), winning 2-0 in game one before taking game two 6-1. It was a pitching duel in game one as Monique Ashley (7-3) started in the circle for the Lady Saints, throwing a one hitter in the shutout. She pitched all 7.0 innings and struck out nine batters in the process. Ashley was stellar in the start. After giving up double with the third at-bat, the Trojans only saw two more bases runner the rest of the game, one from an error and the other from a hit-by-pitch. Five Lady Saints came away with hits, with Jullian Atteberry and Kaitlin Ammermann each coming away with two hits. Atteberry was the lone player with an RBI in game one. Scoring had to wait until the third inning. Paige St. Pierre led off with a double down the left field line, before advancing to second base on a fielder’s choice. Atteberry walked with the next at-bat, but ball four got passed the catcher and allowed St. Pierre to score, making the game 1-0. Following a scoreless fourth inning, Seward got back on board in the fifth inning. A strikeout led off the inning. St. Pierre stepped up next and reached on an error by the third baseman. Following a flyout, Atteberry doubled to right-center, scoring St. Pierre to bring the game to 2-0. Jordan Cordrey (1-5) started in the circle for game two of the double-header, with the freshman picking up her first career win. She pitched 3.2 innings, giving up one run on just three hits. Monique Ashley pitched 3.1 inning in relief, giving up just one hit. Five batters got hits for the Lady Saints, with all of them getting two hits. Leena Mortensen (2 RBI), Kaitlin Ammermann (2 RBI), and Jullian Atteberry (1 RBI) came away with the runs batted in for Seward. The Lady Saints jumped out to a hot start in game two. As the second batter in the lineup, Ammermann drilled a home run over the center field wall to give the Lady Saints a 1-0 advantage. Seward continued their scoring in the second inning with two more runs. Miranda Nester led off with a single and Corinna Porras reached on an error. Atteberry singled on a ground ball up the middle to score Nester. Following a double-play, Mortensen singled on a line drive to left field, scoring Atteberry to make it 3-0. Two doubles in the top of the fourth scored a run for the Trojans, but it was quickly made up by the Lady Saints. Nester singled to lead off the inning, but two straight out followed. Ammermann came to the plate and hit a line drive double to right field on her second pitch to score Nester, bringing the game to 4-1. A fielder’s choice and a walk put Sydney Epp and Paige St. Pierre on first and second for Nester. She hit a pop up right in front of home plate, but the pitcher misplayed the ball, allowing Epp to score from second base. Still wanting to extend their lead, Seward did just that in the bottom of the sixth. Atteberry led off with a double before Mortensen drove her home with a double of her own, making the game 6-1. Seward will be back at home on Saturday (March 3) at 2:00 p.m. for their second conference double header when Northwest Kansas Technical College travels to Liberal.